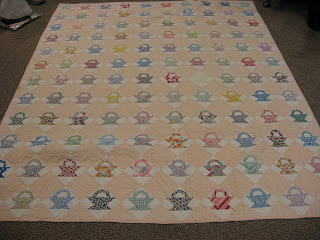 This basket quilt was made by Grandma Ella Gaylord, at Itaska, NY in the early 1940s for my parents Jim & Dorcie Gaylord. There are 120 blocks, each basket a different fabric. Wonderful basket quilt! That is on my "to do" list.